I haven't done a Frugal Fun post in a while because my laptop died and by the time I got it fixed, life had become crazy busy. 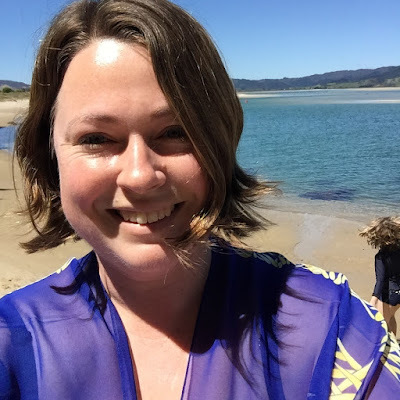 As you know, I recently started homeschooling L. What you may not know is that we were going to be doing most of our homeschooling this term at the beach. My husband had arranged to take an extended holiday from work and I had pulled all the kids out of school/kindy/extra-curriculars so we could go away. Unfortunately, Paul injured his shoulder just before we were due to leave, so our plans got derailed as he's been in and out of doctors, physios and specialists for the past month. We did manage to get one week away at the beach over Labour weekend, in between appointments, so that was lovely, even if Paul could only lie in bed and look at the view out the French doors in the master bedroom. With all of that, I don't think the past month has been particularly frugal. We've had all the extra medical expenses that come with paying for doctors, physios and medication, although we're grateful for every bit that has been subsidised by ACC and the government. We could have been paying a lot more. I patched up the hole in the wall behind our toilet where the plumber had to cut away the plasterboard to access the leaking pipe. I tried to find metal mesh I've seen before that pierces the wall and is able to be plastered over, but both hardware stores I went to have discontinued it. In desperation, I covered the hole with cardboard from a cereal box that I glued on with PVA, and then plastered and painted over that. I know it sounds crazy, but it actually worked. I plastered, sanded, plastered, sanded, plastered, sanded and kept going every day for over a week, building it up until the wall was as rigid and smooth as I could get it, and then I painted over it. It turned out pretty well. I wasn't too worried about getting it perfect, since it's in the corner behind the toilet and has a rubbish bin sitting in front of it, but in any case, it looks way better than the hole in the wall did. I finished an assignment on plant pests and diseases and posted it off. This was for the free horticulture certificate I'm doing through the Open Polytechnic. Five assignments to go and then I'm finished. Woop! Woop! Last night I cooked Chargrilled Capsicum and Chickpea Burgers and it was one of those meals where I got to enjoy the fruits of earlier labour for a relatively easy meal. I used capsicum I had roasted and frozen when they were on special earlier in the year. I also used chickpeas I had soaked, cooked and frozen as part of a bulk lot earlier in the year. I made hamburger buns using our breadmaker and I picked lettuce from the garden to go on the burgers. Tonight's meal was Asian Mince on Rice, and it featured carrots and mint from my garden. I also cooked the rice in chicken stock I had made using scrap ingredients. I bought overripe bananas at a reduced price and used some to make banana chocolate chip muffins and some to make banana chocolate smoothies. I filled up our car when I saw petrol prices had dropped by more than 10 cents per litre. I also used a rewards card for further petrol savings. Two of the kids got free Pita Pit wraps for lunch using vouchers L had received when she won netball player of the day. The vouchers could only be used at a particular store, which happened to be on the same road as the radiology centre where Paul needed to get a shoulder ultrasound, so we got lunch while we were there. Paul and I bought a large Pita Pit salad to share between us and it was delicious. On another occasion, we got a free box of St Pierre's sushi for L's lunch by using a store rewards card. Paul and I made use of our digital Entertainment Guide to buy one Starbucks hot drink and muffin and get one hot drink and muffin for free. We had been driving around from appointment to appointment for his shoulder, so it was nice to stop and do something date-like. I collected a box of seaweed from a local beach for my garden. I collected several boot loads of free mulch for one of the gardens at our family bach. I bought pajamas for S and J from the reduced rack at Farmers - $10 each instead of the original $30 price tag. Both kid have shot up recently, and their full-length jammies were looking more like capris. I borrowed audio books from the library for the kids to listen to in the car while we travelled to the beach. I printed a free maths test I found online, and L has been working through it. It's helping me to identify what gaps she has in her maths that I can address in coming weeks. I downloaded the free Duolingo app to my phone so L can study French each day. We signed the kids up for the free version of Tynker, and they've been using it to learn how to programme Minecraft characters and then bring them into Minecraft. 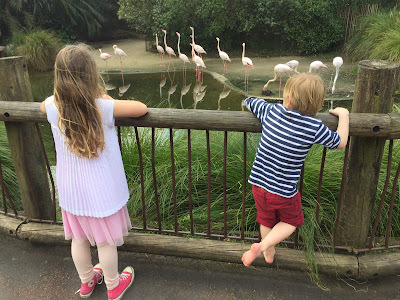 I took the kids to Auckland Zoo using our Friends of the Zoo pass, which we bought earlier in the year when we decided to have S's birthday party at the Zoo. I sorted through all of S's clothes and passed on the outgrown ones to a younger cousin. I also accepted a bag of clothes for J from one of his older cousins. J loves hand-me-downs. They remind him of the person who gave them to him. In fact, the stripy top and red jeans he's wearing in the Zoo photo above were both hand-me-downs. I hardly ever have to buy him clothes because he's the youngest male cousin on both sides of the family. I went to see Thor Ragnarok last night with my dear friend, Anna, and it wasn't frugal, but it was wonderful. Well, it was kind of frugal because we went to Reading Cinemas, which always has good ticket prices. Also, Anna bought us dessert beforehand because she's lovely and it meant we didn't want snacks for the movie. Now it's your turn. Hit me with your frugal successes.